After pricing their IPO at $26, shares of Twitter (TWTR) opened at $45.10 and briefly topped $50 before closing the day at $44.90, giving the company a $24 billion market cap. While most have praised Twitter and the handling of their IPO, I believe management really dropped the ball here. As has been widely reported Twitter loses money and has been investing in growth heavily, so they need as much cash as possible. They failed to raise anywhere near the amount of money they should have by significantly under-pricing their IPO at $26, seemingly giving more consideration to Facebook’s (FB) IPO debacle than to their own balance sheet. Had they priced their offering at even $40 per share, 12% less than what the market ended up valuing them at, Twitter would have added an extra $1 billion to the company’s coffers to fuel future growth. Twitter as a product is great, their social video network Vine is also loved by many with over 40 million users less than a year since launching. TWTR has a great deal of potential to monetize these platforms down the road, but management must be much more prudent in handling their finances moving forward or investors will suffer. With shares up more than 100% in the last 4 months, expectations were sky-high for Facebook’s (FB) 3rd quarter results. Wall street analysts were looking for earnings of $0.19 per share on $1.9 billion in revenue. The market pulse leading up to their results suggested most investors anticipated even better numbers, with the consensus at Estimize predicting $0.21 EPS and sales of $1.93 billion. FB easily exceeded the loftiest of expectations, reporting that in the third quarter they earned $0.25 per share on $2 billion in revenue. Non-GAAP net income grew 100% to $621 million with Facebook recording a 60% jump in revenues year-over-year. Monthly active users grew 18% to 1.19 billion, fueled by a 48% increase in the number of mobile MUAs to 874 million. Once a huge question surrounding the company, FB continues to successfully navigate the shift to mobile away from the desktop. Mobile ad sales rose nearly 600% year-over-year and accounted for 49% of the company’s total ad sales in the quarter. Despite the great numbers, shares of FB are currently trading down after hour afterward after initially gaining over 15%. While investors cheered the quarterly results, comments from management during the conference call quickly soured the mood. Two take aways from CFO David Ebersman’s comments appear to be cause of this reaction. Ebersman stated that while their user base among teens remained stable, Facebook has experienced “a decrease in daily users, specifically among younger teens.” He also suggested that adding more ads to user’s timelines as a way of further increasing ad sales was not an option at this point. While a declining teen user base and an inability to sustain ad sale growth are certainly two issues that would be extremely detrimental to FB, it is necessary to put Ebersman’s comments into perspective, and after doing so the sell-off in shares following the conference call appears to be a significant overreaction. Facebook is far and away the leading social network for teens, with 94% of teenagers in the US using Facebook regularly. Having captured 94% of the potential market already, Facebook is essentially fully penetrated among teens in the US. While a decline in daily usage would suggest that teens are increasingly utilizing other social media platforms in addition to Facebook, with the exception of Twitter (TWTR), Facebook owned Instagram is the next biggest and fastest growing social platform among that age group. Instagram has quickly grown to 150 million users, up from 100 million in February, justifying Facebook’s $1 billion acquisition of the company last year. Should teens continue to spend more time on other social media platforms, the detriment to Facebook is largely limited by the fact that Instagram would likely be the biggest beneficiary of any further migration away from the site. If retaining users is a concern, then the negative response to Facebook not looking to increase the number of ads users see is quite irrational. Further saturating the user experience with more ads would be the easiest way for Facebook to turn users off to their product, something they can not do if they hope to remain the world’s dominant social network. Increases in advertising prices will drive revenue growth going forward, not an increase in the volume of ads, although volume will naturally increase anyways as Instagram begins rolling out advertisements. Facebook is wise to refuse to sacrifice the user experience in the hopes of appeasing short-sighted investors. With their numbers clearly indicating they are firing on all cylinders, FB simply needs to stay the course and continue executing on their plans, the markets will eventually get it. 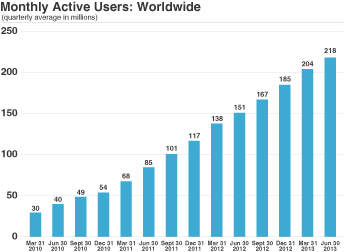 Twitter had 218 million monthly active users as of 6/30/2013, an increase of 44% year over year. Of the 218 million, 169 million are international users. Twitter’s 218 million active users tweet over 500 million tweets per day. 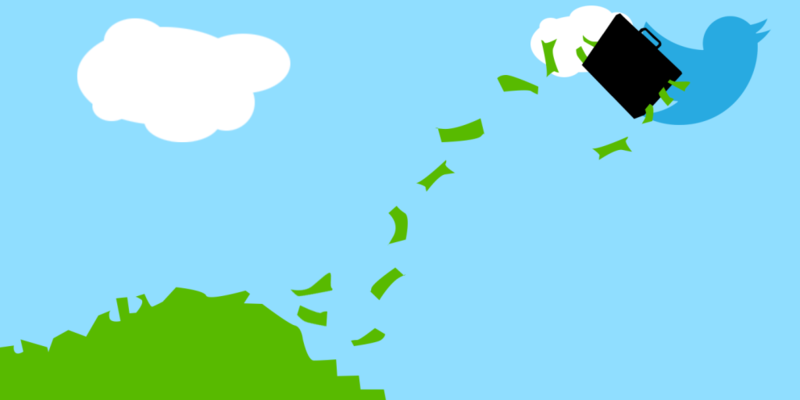 Revenue for the first 6 months of 2013 of $253.6 million, an increase of 107% over the first half of 2012. Twitter generates 65% of their advertising revenue from mobile devices. Net loss for the first half of 2013 was $69.3 million, an increase of 41% year over year. Adjusted EBITDA increased from $0.7 million for the first 6 months of 2012, to $21.4 million in the same period this year. 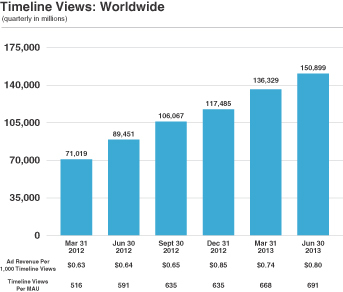 Twitter is using “Timeline Views” rather than pageviews to measure their ability to monetize their platform. Twitter defines timeline views as the total number of timelines requested when registered users visit Twitter, refresh a timeline or view search results while logged in on our website, mobile website or desktop or mobile applications. Twitter defines advertising revenue per timeline view as advertising revenue per 1,000 timeline views during the applicable period. In the three months ended June 30, 2013, Twitter’s advertising revenue per timeline view was $0.80, a 26% increase YOY. In the three months ended June 30, 2013, TWTR’s advertising revenue per timeline view in the US was $2.17 and $0.30 in the rest of the world, increases of 26% and 111% from the three months ended June 30, 2012, respectively.